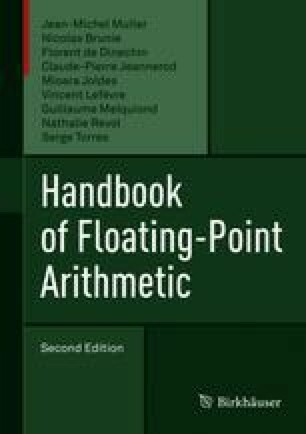 Chapter 7 has shown that operations on floating-point numbers are naturally expressed in terms of integer or fixed-point operations on the significand and the exponent. For instance, to obtain the product of two floating-point numbers, one basically multiplies the significands and adds the exponents. However, obtaining the correct rounding of the result may require considerable design effort and the use of nonarithmetic primitives such as leading-zero counters and shifters. This chapter details the implementation of these algorithms in hardware, using digital logic.